Tired of how your dining room looks? Why not spruce it up a bit with these best dining room chair covers? It will definitely add a new element into the room’s overall design while making your chair look new and stylish. It will also help protect your chair from stains and other unwanted accidents. And to make your search for the perfect covers that will meet your styling needs, here’s our list of the 12 best slipcovers you’ll find on Amazon. What are the measurements of your chair? How is the cover secured into place? Are there plenty of colors or designs available? If you’re looking for beautifully crafted dining room chair covers, then you’ll love the Subrtext Jacquard Stretch Slipcovers. These are very stretchy, fitting almost 90% of chairs, and made out of 85% cotton and 15% spandex. The covers are soft but resilient enough that it can protect your chairs from any pet scratches and hairs or stains from kids. In addition, the breathable fabric is environmentally-friendly and anti-mildew. And there are 8 colors for you to choose from. The Sure Fit Stretch Pique is a dining chair cover that is made up of 94% Polyester and 6% Spandex. It has a form fit stretch that will contour itself to the shape of your chair. The reupholstered look is created by the smart seam details and elastic bottoms of the cover. To make sure it stays in place, the cover features an elastic with velcro attached to the sides that connect under the seat. And you can choose between 6 gorgeous colors. If you have brand new chairs or at least they still look sort of brand new, then you might be in the market for this kind of chair cover. These vinyl chair protectors from LAMINET prevents spills from staining your lovely cushioned seats. It features adjustable front flaps to create that perfect fit. And the vinyl is transparent enough for your chair’s original decor to shine through. If you have a little more money in your budget for dining chair protectors, you can upgrade to the SmartSeat Chair Protector. Unlike our other pick, this one is made out of soft, comfortable fabric that also happens to be waterproof, stain resistant, and machine washable. It’s easy to set up with its adjustable straps and will fit most chair styles and sizes. It comes in 5 different colors. The Weshine Knit Spandex Fabric Dining Room Chair Slipcovers are another of our top picks for several reasons. Made out of polyester and spandex, the fabric is stretchable, breathable, soft, and anti-wrinkle. It has a sewn-in elastic hem that will make sure the cover stays secure. And the stretchable material ensures that it will conform to the contours of your chair to create that perfect fit. Best of all, you get 4 covers for less than $20 and the choice between 18 colors. These Jacquard slipcovers from Chun Yi are made out of 85% polyester and 15% spandex. The fabric is soft, comfortable, and stretchy. It is also anti-mite, waterproof, and oil proof. And it comes with velcro straps that go beneath the chair to ensure the cover stays in place. The short dining chair cover from Jiuhong is made out of soft, comfortable stretchable, wrinkle resistant material and features a sewn-in elastic hem to secure the cover into place. The cover can fit most Parsons chairs. Similar to other chair covers on our list, this is also machine washable. This particular cover comes in 42 designs, most of which are floral or funky. SHZONS’ Dining Chair Covers are made out of spandex that makes them incredibly stretchable to fit different sized chairs. The fabric is soft with a “silky” feel to it. The patterns and colors offered by the manufacturer add elegance and style to any dining room. Like most of our picks, this cover’s material is also wrinkle resistant and machine washable. ViveVita’s Everyday Elegance Dining Chair Cover is one-of-a-kind. It features a polyester surface and plastic waterproof backing to protect your chair from spills and stains. The material is soft and much more comfortable than vinyl protectors. There is a velcro strap in the back that’s easy to use, securing your cover stays in place. 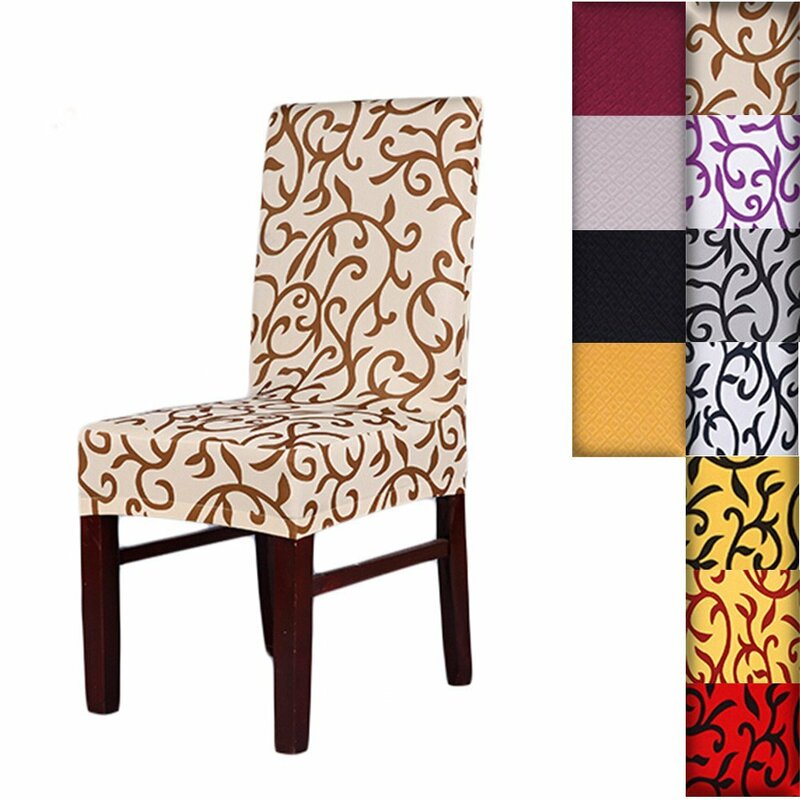 If you want to turn your ordinary dining room into a classy one, then you definitely need to get the Surefit Scroll Full Dining Room Chair Cover. Unlike the rest of our other picks that only go past the chair’s cushion by a couple of inches, this slipcover includes a straight waterfall skirt that goes all the way down to the floor. Can we say “elegant?” The cover is made up of 60% cotton and 40% polyester and features 8 ties at the four corners to help you adjust the fit and create a tailored profile. Whether you’re looking for a cover to keep stains and spills from ruining your chairs or need to spruce up your dining room’s appearance, dining chair covers are your most affordable option. These come in different styles, materials, and sizes allowing you to find one that will fit your taste and needs. To help you sort through the numerous choices before you, below are a few tips we’ve collected. Before you look at designs, materials, and prices, you should definitely get your chair’s measurements. This way, you have a better idea of how the cover will fit. A lot of our picks would fit a Parsons chair such as the Sure Fit Stretch Pique and the Jiuhong Stretch Short Dining Chair Protector Cover. Some covers will fit most chair styles and sizes such as the SmartSeat Dining Chair Cover and Protector. While others are more suited to a certain chair’s shape such as the Everyday Elegance Kitchen & Dining Chair Covers. Most of our picks are made out of polyester and spandex because they are soft and very stretchable, allowing them to fit chairs of slightly different sizes while still offering comfort. Some like the LAMINET Vinyl Chair Protectors are made out of vinyl to give you a waterproof cover while still allowing your chair’s design to show. The Everyday Elegance Kitchen & Dining Chair Covers, on the other hand, is made out of polyester with plastic backing for that “waterproof” effect. While others are made out of 60% cotton and 40% polyester such as the Sure Fit Scroll Dining Room Chair Slipcover. use a sewn-in elastic band at the bottom of the cover to keep it in place. Others such as the Sure Fit Stretch Pique and the Chunyi Jacquard Polyester Spandex Small Checks Dining Chair Covers use velcro straps that run beneath the chair to attach the cover. The Sure Fit Scroll Dining Room Chair Slipcover, on the other hand, features several ties to help you adjust the fit and to keep the cover secure. Most of the dining room chair covers in Amazon are very affordable, less than $10 a piece. Of course, some do cost a lot more (around $15 to $20 per cover) but they often are of higher quality. In the end, price and design really do not matter as much as fit and material. Then again, when it comes to dining room chair covers, it’s all a matter of preference.